Mr James Angus, Buchanan Street, Glasgow. In 1892 Mr James Angus acquired the lease of the Station Hotel, Buchanan Street. Mr Angus was well-known as lessee of the Theatre Royal Bars, when he came into possession of the hotel, alterations and improvements was the first of a long list of duties he had to attend to. Originally a commercial man himself, his knowledge of the wants of the travelling public has been gained in the wide field of personal experience. When the hotel was completely renovated the event was celebrated during that month with what to Scotch folks is known as a house-warming. 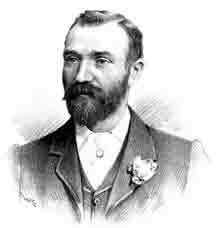 The following extract from one of the Glasgow dailies regarding the occasion may be interesting:- "Last night Mr James Angus, the new proprietor of Buchanan Street Station Hotel, gave a complimentary dinner and dance to his local friends and patrons. The occasion of the gathering was a sort of house-warming, as Mr Angus has just completed a number of improvements which he has been carrying out on the hotel. There was a merry party of ladies and gentlemen present last night, Rev. W. Fergus of Blythswood Parish Church, making a very happy chairman, and in a neat speech spoke in flattering terms of the new proprietor. Mr Angus suitably replied. Among the toasts were those of "The Provost, Magistrates, and Town Council," and "The Municipal Interests of Glasgow," the brevity of the speeches being in marked contrast to the customary eloquence of after-dinner orators. Messrs. Sharp, Bathgate and White contributed vocally to the dinner-table entertainment, a very agreeable dance bringing the evening to a close." Among the gentlemen who took part in the proceedings were Bailie Ness, Kirkcaldy; Messrs. F. Sephton (Royalty Theatre); E. McLean, Bank Restaurant; W. R. Cuddeford; Andrew Myles, Bathgate (Dryburgh & Co.); McGlashan; Stewart, Bissett, and F. C. Cowlard, of the Theatre Royal; Messrs. Sephton and Myles acting as croupiers. The accommodation for sleepers at the hotel is ample and every arrangement has been made with a view of adding to the comfort of travellers and touring parties. This branch of hotel management having been made a special study by Mr Angus since entering upon his lease, boarders may rest assured that their requirements will receive the personal supervision of mine host himself or that of his good lady, either of whom are en evidence at the port of duty. On the first landing will be found the dining, coffee and smoke-rooms. The coffee-room alone accommodates about sixty persons with ease. The smoke-room is of good size also, and while not so elegantly furnished as the principal room, is very suitable for meetings, &c. We should also mention that there is a good billiard-room leading from the tap or refreshment buffet. Since the improvements have been completed there have been quite a number of marriage and supper parties in the hotel, all of which passed off satisfactorily. Luncheons and ordinary dinners may he had at all hours of the day, and as the cooking arrangements are in the hands of an expert chef, the wants of the inner man are supplied in a manner that should gratify even the most of the well-known brands to which we should add Mr Angus's famous "Marmion" blend of whiskies, an especial favourite with professional men. Ales and stouts of well-known breweries are well represented and the famous Bavarian beer, for which our friend Mr. Bischoff is agent. Mr Angus is a man of character, and never does things by halves; moreover, being, so to speak, self-made, he knows well what it is to overcome the ordinary difficulties of a business career. The Buchanan Street Station Hotel has been licensed since 1872.